Konishi Hirosada (ca 1810 - 1864) Nakamura Tamashichi I as Sutewakamaru, 1850. Oban. This is an outstanding and rare print by Hirosada. Hirosada produced hardly any oban prints at all in his lifetime and so this is a rarity in that respect alone. The print shows Nakamura Utaemon IV as Ishikawa Goemon, in the square cartouche and Nakamura Tamashichi I as Sutewakamaru in the play Chigogafuchi koi no shiranami. John Fiorillo notes that this design is apparently also an unknown print and as such also extremely rare and desirable as a consequence. The print has suffered a great deal and is not in best condition, it is nevertheless, a rare and potentially nearly unique piece. The play (The Chigo Deeps and the White Waves of Love) combined the legends of the outlaw Goemon with a revenge tale involving the temple page Shiragikumaru (renamed Sutewakamaru in the drama). 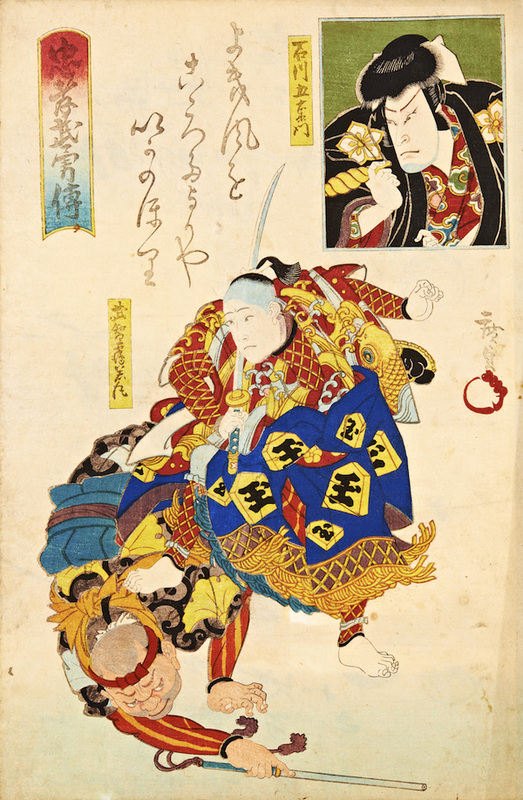 The conflated saga includes Sutewakamaru vowing to avenge the death of Takechi Mitsuhide who had been slain by Mashiba Hisayoshi (the theatrical namesake for the historical shôgun Toyotomi Hideyoshi). This links the Sutewakamaru plot with various Ishikawa Goemon mono ("plays about Ishikawa Goemon"), the legendary fugitive outlaw during the reign of Hideyoshi. Later in the play, Sutewakamaru (in this production, performed by Nakamura Utaemon IV) is transformed into Goemon. This print was published soon after the relaxation of the Tenpô Reforms (Tenpô kaikaku) ― edicts that in 7/1842 banned actor prints in Osaka, virtually halting print production in Kamigata for five years. The series title, Chûkô kijinden (Stories of remarkable loyalty and filial piety), is indicative of the guarded approach to Osaka printmaking following the reforms. A gradual weakening of enforcement ensued despite reiterations in 1844 and 1845 by the government of its intention to continue the reforms, and by 1847 relatively normal print production had resumed, though printmakers played their cards close to their vests for nearly a decade afterwards. The use of didactic or moralizing titles was intended to endow a print with a loftier purpose. Another bit of "camouflage" was the omission of actor names, although the accurate physiognomies were easily identifiable by patrons of yakusha-e, who would have been intimately familiar with the performers and current stage productions. These transparent gestures would not have fooled the censors, but avoiding explicit references to actors apparently satisfied the letter of the law. The title of the print, Chûkô buyûden, may be translated as "Chronicles of courage, loyalty, and filial piety"). The poem (unsigned) reads: Yokikaze o/ kokoro taiori ya/ ikanobori. The print has suffered from bad mounting in the past and there are residues of adhesive tape etc on the reverse. There is significant thinning to some areas of the print. Colour and impression though are fine and the blue of Tamashichi's robe is richly encrusted with mica.